This is not a story about a high-profile hockey prima donna, or a celebration of a team achieving glory and triumph. It is instead a tale about a young man deep in the throes of struggle, the mixed blessings of having an exceptional hockey pedigree, and the ironic joy that can come with anonymity. It begins far away from the game’s best-known hubs. On the ice in Bozeman, Mont., in a barn that’s anything but a palace, the teammates of our main subject refer to him simply as “Jude.” He’s a stocky, soft-spoken 19-year-old from Minnesota with a distinctive jawline that seems to run in the family. He decided to play in the Tier III American West Hockey League for the same reason hundreds of other lads his age do: to get enough quality ice time and real game experience at the Junior level so that one day, just maybe, he’ll make a college roster. Here, at this point in our story, it’s perhaps important to mention another detail: On the back of Jude’s jersey above his number—29—happens to be one of the most famous surnames identified with our sport. 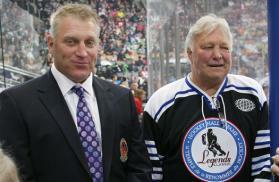 Both his father, Brett Hull, and grandfather, Bobby “the Golden Jet” Hull, are in the Hockey Hall of Fame, legendary for their blistering shots, charismatic personalities and prolific ability to score goals. When Jude was nearing his fifth birthday in 1999, his dad notched the Stanley Cup winner for the Dallas Stars. But even today, as Brett will tell you based The surname Hull is synonymous with goal-scoring excellence. Above, Brett and father Bobby during a Hockey Hall of Fame induction ceremony in Toronto.upon his own personal experience, being the son of a Hull offers no coattails that guarantee a free ride. Jude doesn’t take shots; he blocks them, and over the course of this 2012-13 season, he and close friend John Slavik, with whom he shares goaltending duties, have faced an unbelievable barrage. For teams taking on the hard-luck Icedogs, it’s been a veritable shooting gallery of opportunity. Jude and his sisters accompany their father to Colorado Springs, where Brett was honored by USA Hockey in 2003. By the time this season ends, with Hull and Slavik starting in about 24 games apiece, each goalie will be peppered with around 1,400 shots, or more than 50 on average, per game. In just two consecutive contests in December, young Mr. Hull, for example, faced nearly 170 shots. Long ago, the Icedogs, which have suffered several double-digit losses, realized they wouldn’t be contending for the league title or even making the playoffs. At the halfway mark, they were an imperfect 0-25 in the category of futility. Hull went home to Stillwater, Minn., for Christmas break having faced enough rubber to leave anyone feeling shell-shocked and dispirited. “A lot of guys having a season like this, at any level, would’ve stopped trying, quit or not returned,” says Icedogs Coach Steve Harrison, a former pro scout who has experience coaching in the upper echelons of Canadian Junior hockey. On January 19, playing on the road in the natural gas and coal mining boomtown of Gillette, Wyo., the winless streak finally ended after 33 games. With Hull enduring a blizzard of 53 shots, he led the ‘Dogs to their first “W” of the season. After the buzzer sounded, a fan could have mistaken the euphoria for a team winning Lord Stanley’s Cup. The real question, indeed the most meaningful one in an age when so much success in competitive sports is measured by individual accomplishment, win-loss records and championships, is what motivates Jude Hull and makes him stand out? The answer may be surprisingly simple: He’s grounded, his elders say, in the stuff that matters. From out-of-the-way Bozeman, located in the heart of the northern Rockies, Hulls stays in contact with his folks by phone. Having to cope with the shadow cast by Bobby, Brett is glad that Jude isn’t a forward. 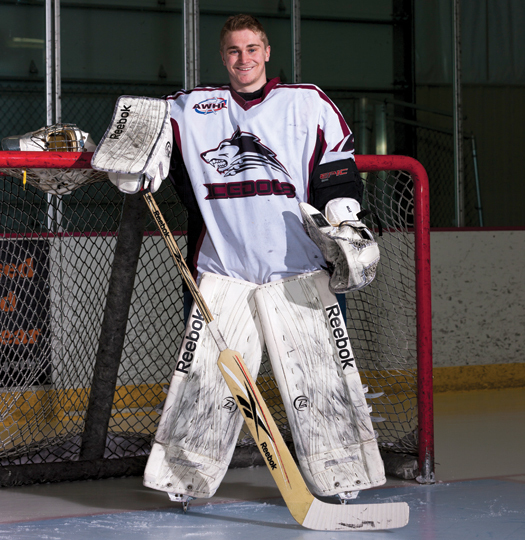 “Being a goalie he’s got nothing to live up to, no comparisons to grandpa or to me. He’s just a guy in the net stopping pucks,” his dad says. This third-generation Hull didn’t come to Bozeman expecting to receive any kind of preferential treatment because of his name. The young man’s humility has left a big impression on Harrison who says it’s a more mature perspective than even some NHL players have. Most poignantly, it’s provided a big lesson to Hull’s teammates. Jude admires everything his father and grandfather accomplished, but when he was young, while Brett was on the road, he says his anchor was his mom. He is a product of youth development programs in the state where his dad first registered an impact on American hockey — as a standout with the University of Minnesota-Duluth bulldogs. An admitted tomboy, Alison grew up playing pond hockey in Duluth with her brother and neighborhood kids. Eventually, she became a goalie. Even today, Jude and Alison love suiting up together on Sunday nights for pick-up games. At St. Paul Academy, a prep school in the Twin Cities, Hull amassed a respectable .856 save percentage his junior and senior years against tough opponents, including teams with D-I recruits and NHL draftees. After high school where he had decent grades, he won a tryout with the NAHL’s Odessa Jackalopes, but the coaches concluded he needed a bit more seasoning. Over the years, more than 50 players have used the Icedogs as a springboard toward college. In 2011, Icedogs rivals the Helena Bighorns claimed the national Tier III championship. After a tough practice, Jude shows up dripping wet to an interview. Soon, he’ll head to a session of dryland and hit the weight room to do strength work. He’s carrying a soft smile and when he’s reminded of the rising tally of shots, the grin beams wider. 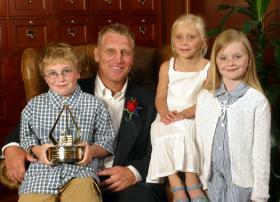 Parents, Brett Hull says, shouldn’t try to coddle their kids or protect them from adversity. He learned more, he says, by having to negotiate difficulty — losing streaks, conflicts with coaches and playing through aches and pains — than the periods when extra effort wasn’t required. It also helped him savor winning more. He acknowledges it’s often easier said than done. While Brett Hull doesn’t claim to possess special wisdom about being a superior goaltender — during his days with the Dallas Stars one of Jude’s favorite players was Ed Belfour — he has suggested that Jude think about his job from the perspective of a shooter. With 741 career goals (third highest in NHL history) and 1,391 points accumulated over 1,269 games, Jude says his dad is loaded with insight that he’s incorporated into his game. For his part, Harrison has no doubt that the kind of grit and improvement Hull and Slavik have demonstrated this season will serve them well in seasons ahead. Hull’s mom says he’s already had a season he’ll never forget and his passion for the game — even if he’s only playing pickup — hasn’t soured; it’s grown. Brett Hull notes that this kind of character building has implications far away from the ice rink. Knowing how to maintain composure, persevering when things get tough, emphasizing positives over negatives are lessons people spend their whole lives trying to learn. “I’m proud of my son for trying to be that kind of person,” he said. That’s not just high praise coming from a hockey dad; it’s a heartfelt reflection from an icon who himself learned to grasp the bigger picture.